We are off to a good start with the first week of the schedule and working on time, I feel accomplished and organized. I think now that I have everything planned, I have a lot of time to do other things that I could do to improve myself and my work as well. I recommend you to follow a schedule as well if you are not because this will help a lot with everything. It may be a little bit hard at the beginning, but as you keep going, it will be easier for you to manage all of it. This would be the first thing that I accomplished this month and I would say it is the most important thing to do before anything. I heard a quote from a successful people that everything won't work only if you be consistent in your work and no results will start showing if you do it randomly or whenever you feel like doing it. 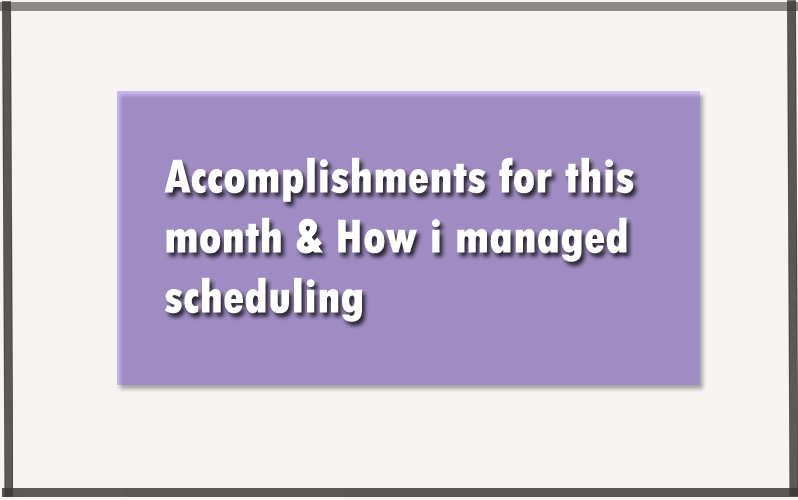 This is supposed to be a celebration post for our accomplishments for this month, but since I got nothing that exciting to share, I will be going through how I managed to schedule everything and mention some of the little things that got accomplished during this month. This is not only about me, but everyone which you can share your wins and what you've got done in the comment section. I'm trying to improve my blog content and focus more on creating good quality, I want to let topics such as this one which 'the celebration time' and the other one which is 'the discussion' topic to be in my social media instead of here, because I feel like it will be better there and I can only make the blog for content and more things related to it. I tweeted a poll in my account, check it out here and tell me what you prefer, please. Sometimes we manage to go on schedule with everything until something comes in the way and ruin. This always happens to me all the time, and I still manage to finish everything but with little bit struggle. However, this doesn't mean it will be every day, which could happen once or twice, maybe three times a week. The first thing you need to do in order to have a good schedule that works for you and this for everyone. Listing everything that should be done daily is the first thing which is the daily routine because most likely, that would be the most important things we all need to get done. You can write them down on a paper or planner, but it's not necessary because you can do that in your mind. Once You can have a clear vision of what you should do, you only need to know when it should be done. This depends on everyone's choice because we all have different things in our life and you find the perfect time for it based on your day and when you need to get it done. I would say, considering what is more important earlier in time is going to be a good thing for you at the end of the day. I prefer to schedule everything in my mind and work on it, I don't have to write them down or set an alarm to remind me about it, but if you find that helpful for you because sometimes people forget about things they planned for when they get distracted by something else. Also, I used the planners to write all my daily routine and goals, for some reason, it didn't work for me. However, I do everything fine by organizing them on my mind and just get them done right away. I haven't got that much of accomplishment other than what I stated at the beginning of this post and a few other stuff because I was distracted by other life assignments. However, I'm starting to get back on track quickly and work a lot more than before. It's working pretty well in the first month, I won't stop or get distracted again because I'm trying to make sure everything is organized and well set. I want to say thank for people who subscribed for my blog and viewing my posts because this month, my views started to grow up a little bit and I'm grateful for that. It does not matter how many people as long as there is someone reading, viewing my content, it counts. Probably, As I keep working, it will grow more and more every day. I'm only 200 followers far from my first 1k on Instagram which an amazing thing to me. Because I have never been this far in my life, I was looking at people getting excited once they reach a milestone and at that time, I didn't know how it feels until I got my first 500. However, I already reached up to 3k on my old twitter, sadly, my account got deleted and I had to start over. All of these accomplishments are blogging related and social media, however, I haven't done anything interesting in real life to share it here. You can tell that I'm more focused on my work and my blog because this is all I have to worry about right now. Although there are some of the important things that I should really focus on and I will put it on my goals list for the next months. I would like to know your wins for this month whether blogging related or in real life. Also, make sure to help me decide where should I put this topic and the discussion because I think social media is better for these things than here. Make sure to be safe and have a good noon and possibly a perfect day.